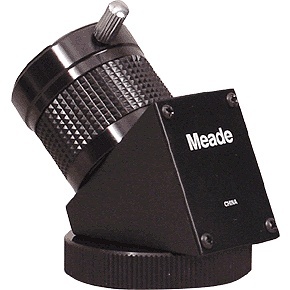 This 45-degree viewing angle image erecting diagonal has a knurled ring that threads onto the Cassegrain focus at the rear of Meade ETX60, 70 and 80 refractors only. It will not fit the Meade ETX-90/105/125 scopes (use #932 instead on these models) or any other telescope. The #933 has a built-in Barlow lens that is needed to transfer the image through the longer light path of the image erecting prism. This acts to boost the power of any 1.25" eyepiece by 2.4x, so lower power eyepieces are generally recommended. Since the rule of thumb for terrestrial observing is that the maximum usable magnification with refractors is about 1x per mm of aperture, it can be seen that the built-in 2.4x magnification could cause problems if too high a power eyepiece is chosen so this unit is best combined with a 26mm eyepiece. A chrome thumbscrew holds eyepieces firmly in place. It is fully coated for high transmission.